All aboard the pedalboard… it’s boarding completed. 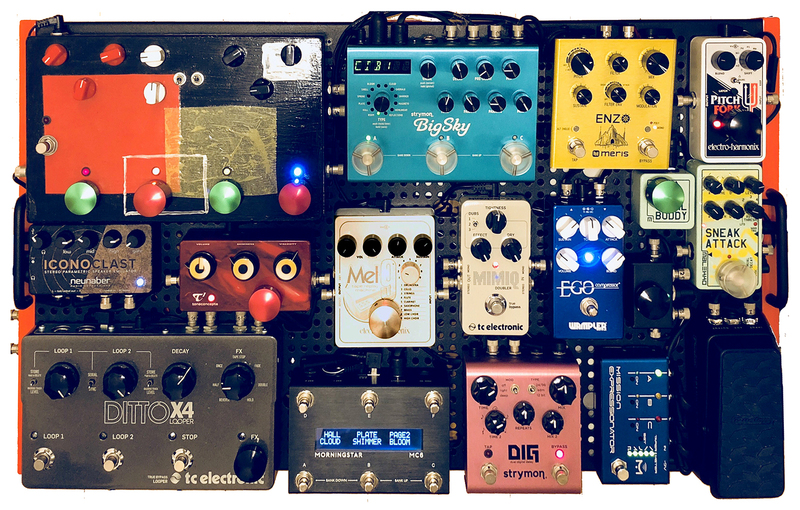 No more space in our pedalboard after the addition of Meris ENZO synthesizer, Morning Star MC6 MkII MIDI controller and Mision Engineering EXPRESSIONATOR expression pedal controller. From the previous version, a few pedals had to be relocated and other squeezed closer together to make room. There are a total of 52 switches and 60 knobs on this pedalboard. There is also a some news about connectivity (arrows). Instrument inputs remain the same, with the switch that toggles between guitar #1 and #2 in between them. Above them, there are 4 outputs. Normal unbalanced outputs (left and right stereo channels) come right after the effects chain (minus Iconoclast). Below them, balanced outputs coming after the Iconoclast. On the left side, we still have the DITTO X4 switches (one each for left and right channels) that switch the order of the TC Electronic DITTO X4 looper in the effects chain. Leds red: the DITTO X4 is before the Strymon DIG dual delay and BigSky reverb. Lets green: the DITTO X4 is after the delay and reverb, but always before the Iconoclast. This is because the looper works differently in the two positions, and this set-up, although increasing exponentially the amount of cables running underneath (see below), allows for maximal flexibility. Also on the left side, we have three USB contacts to connect the BIgSky, Iconoclast or DITTO X4 to a computer. This is to facilitate editing parameters or downloading and uploading audio clips, in the case of the DITTO X4 looper. Apart from the mass of cables, we can see a few new things. The Cioks DC-10 Link power supply replaces the previous DC-10. The new Link model affords more connectivity and power. Also new is the TC Electronic Bonafide buffer (upper left), running right after the EGO compressor at the beginning of the chain. (We tried it between guitar input and compressor, but this introduced noise.) 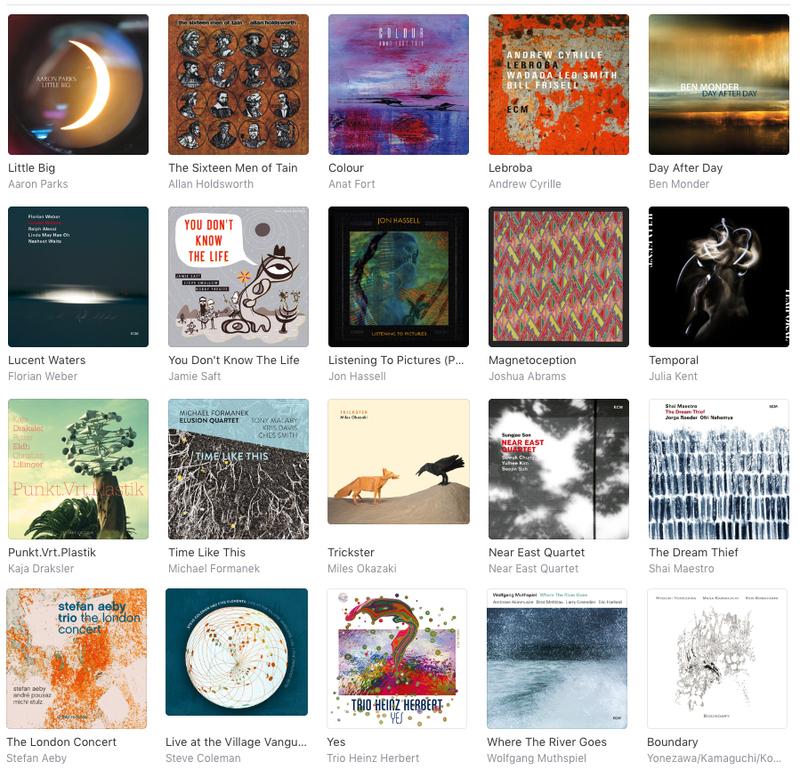 At the bottom, we see Radial Engineering Tonbone Shotgun stereo splitter. This allows us to run the stereo signals to the outputs either before (unbalanced, to connect to the amps) or after (balanced, for recording and PA systems) the Iconoclast. In the upper right corner, we see a tiny box containing the MIDI/USB adaptor that allows to connect the MIDI in/out from the BigSky to the USB output contact. 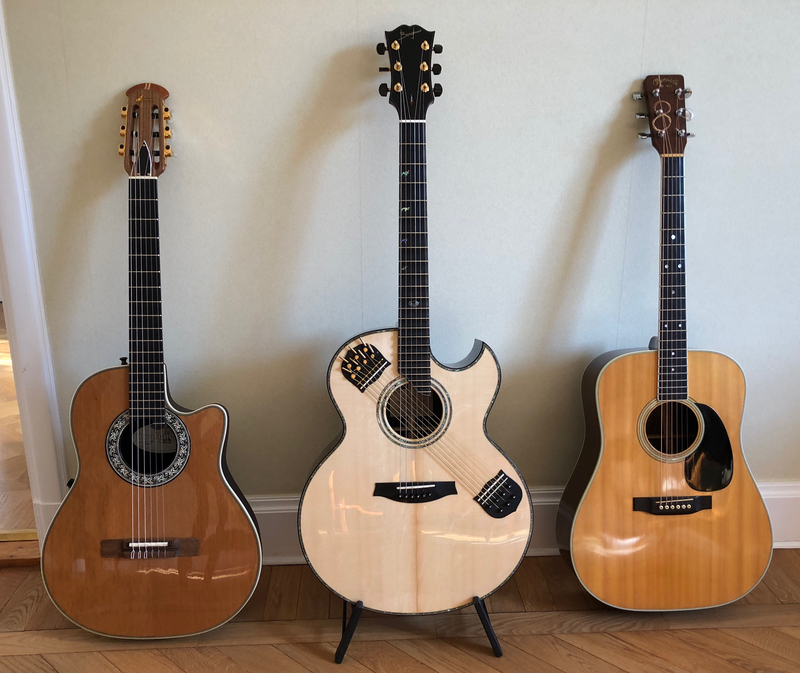 Borghino Shakti guitar (centre) joins the “acoustic family”. Here pictured alongside our Martin D35 (right) and Ovation #1863 (left). Here is a late-night meditation with the Borghino through a ToneDexter preamplifier, NUX Atlantic delay/reverb and Roland AC60 amplifier.